Presenting at 5 and 6 PM, The Preservation Legacy Band with Gregg Stafford. Presenting at 8, 9, and 10 PM, The Preservation All Stars with Lucien Barbarin. Gregg Stafford’s trumpet playing is seeped in tradition. In his youth, however, he had no desire to become a musician. By chance, his high school band leader needed a trumpet player and recruited Stafford. Nine months later, he started marching in parades. He was sixteen years old, and at that time, in the late 1960s, brass band music was for “old men.” But Stafford had grown up watching brass bands and loved practicing tunes at home. He began playing in the E. Gibson Brass Band with childhood friends Tuba Fats Lacen and Michael Myers and subsequently in Danny Barker’s Fairview Baptist Church Band. Stafford also played in the Young Tuxedo Brass Band, which he went on to lead, and the Olympia Brass Band. Decades before he began playing regularly at Preservation Hall, Stafford came by to hear the music. But he absorbed much more from the musicians he thought of as fathers—Louis Cottrell, Harold Dejan, Albert Walters, Jack Willis, Teddy Riley, and many more. These men taught him about history, pride, and values. Stafford says music holds the people and the community together; every time he plays, he holds audiences in rapture. Trombonist Lucien Barbarin made his musical debut at age six playing drums with his uncle Paul Barbarin’s Onward Brass Band. For five generations, the Barbarin family has been one of the premier families of brass band music and jazz. The family patriarch, Isidore Barbarin, mentored the young Louis Armstrong nearly a century ago in the original Onward Brass Band, and years later, Armstrong recruited Isidore’s son Paul (Lucien’s uncle) to play drums with his big band in the 1930s and 1940s. In grade school, Lucien picked up a baritone horn, but when he arrived home with an instrument case bigger than he was, his mother was a little skeptical. With a shortage of tuba players in his junior high band, Lucien volunteered to play. By high school, Barbarin had taken up the trombone. He played rhythm and blues gigs around New Orleans with the groups Stone Mountain and Joy, but an invitation to work with drummer Albert “June” Gardner drew Barbarin toward traditional jazz. Since then, he has played with the Tuxedo Brass Band, Wynton Marsalis, Dianne Reeves, Doc Cheatham, Harry Connick Jr., and Lionel Hampton. 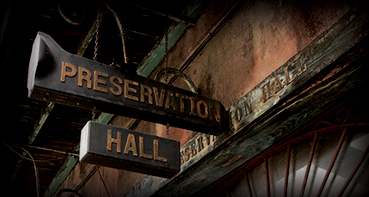 Barbarin began appearing regularly at Preservation Hall in the early 1980s.